Wow what a beautiful view. I’ve been saying that a lot lately, but it is so true. These National Parks that we have in our own backyard are just gorgeous, but it seems like they’re enjoyed by way more foreigners than Americans, which should be a national embarrassment. You would think that it would be over run by us traveling near and far across our great country to get to them, but in my 2 month’s experience it’s been a majority of people from other countries that we see and hear on the trail, view point or parking lots that are enjoying them the most. There is nothing wrong with that, but it seems to me that Americans are either too damn lazy or just don’t appreciate what we have. It’s kinda of scary when you think just a couple years ago one of the Bush Administration’s many disastrous ideas were to privatize the National Parks, which would have done irreparably damage to these pristine lands. What a wonderful idea and it is purely an American one at that. Other countries have copied us and I congratulate them for doing so, but it is in my opinion one of America’s greatest ideas. 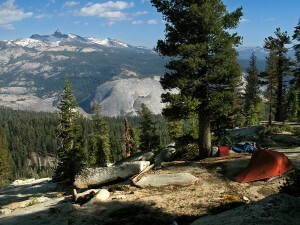 Anyway our trip from Sunrise High Sierra Camp to Clouds Rest wasn’t unusually spectacular until we found our last camp site. We were out of water and since we were so high and still climbing it wasn’t likely that we’d find any without a long hike back down the mountain to a stream about 2.5 miles and 1,000′ below or we could hike up higher and melt some snow. I was dreading both ideas since I was beat from a long, hot day of hiking. That’s when I noticed the ravine below us was a little greener than the upper part, so I dropped my pack to investigate. Sure enough there was a small pure crystal clear spring emerging from the white granite gravel, so we drank our fill and filled our water bottles. Now to find a camp site. As we were hiking up I noticed that I could see the land dropping off of the other side of the trail and asked Jen to “trust me” I can guarantee there is a good spot just over this next hill, but she wanted to continue on up the mountain. I finally convinced her that this would be the last spot before our finally ascent to the summit of Clouds Rest, which is just under 10,000′ and what a spot it was. OMG, it was our best camping site by far. We had a spectacular view of our previous spot in Echo Valley that dropped off some 5,000′ below and 180 degrees of unobstructed view looking North and South. It came complete with a nice tent site, camp fire ring and some wood. Oh boy, the fresh trout I have on snow is going to taste good tonight. The site even had our little fuzzy buddy neighbor the new born fawn that was just in the camp site next to us. He was adorable and would not move even though we made a lot of noise before I hopped over the log it was hiding behind. 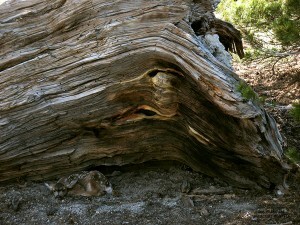 Here is some info on Clouds Rest copied from the web. “Clouds Rest, a massive granite formation just northeast of Half Dome in Yosemite Valley, is one of the defining hikes in Yosemite National Park (YNP). 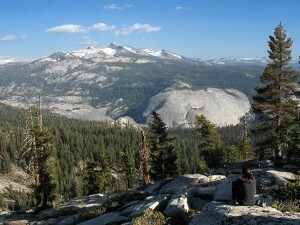 For casual visitors, it ranks with Half Dome and North Dome as one of the most recommended hikes in the valley and for viewing the valley. 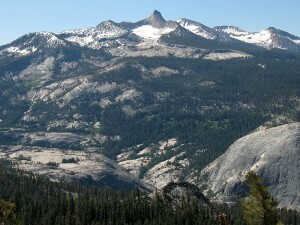 Geographically, Clouds Rest lies in the center of nearly every interesting feature in Yosemite. Great views are to be had of Half Dome, the Clark Range in the south, nearly all of Cathedral Range, and even out to Matterhorn Peak and the Sawtooth Range. Hi! I just wished to take the time to create a comment as well as say I’ve really enjoyed reading your blog. Thanks for all your work. Beautiful Pictures! Sad to leave I bet. I was looking at doing the clouds rest hike this summer. Was the campsite an actual site or something you were fortunate enough to find? I would love to be right there! I also agree with the sad state of affairs where we can’t get our own people in our Parks. There is beautiful stuff off the highways! Thanks again. If you’re going in reverse it’s just pass the peak of Cloud’s Rest I’d guess about 0.5 miles. It will be to your right as soon as you hit the first flat area. Drop your packs and explore a little down the slope. Have a great trip!